Light: Being drawn to someone. Longing for someone or something. Acting on your desires. Discovering a feeling is mutual. Doing what makes you feel good. Merging. Healing broken ties. Admitting two people feel differently about each other and moving on. Shadow: Burning bridges. Becoming caught up in unhealthy codependency. Shutting out anyone but your chosen few. Obsessing on someone who does not return your affections. Despairing over finding “The One.” Deceiving yourself about your true orientation. Story: The Main Character improves his or her lot by joining with likeminded others. Relationships. In a healthy relationship, everyone involved feels safe enough to reveal how he or she really feels. Feeling attraction? Say so. Not invested? Say so. Reflected love is a balm for the soul, but hidden or repressed emotions will poison a relationship. Work. Meet your goals more easily by recruiting others who see things your way. If what you’re doing now doesn’t thrill you, admit it. Do what delights you, or engineer a change of heart that allows you to enjoy what you’re doing now. Spirituality. The idea that your spiritual practice must satisfy anyone other than yourself is an illusion. Do what you feel drawn to do. Find support and solace with like-minded individuals. Forgive spiritual abuse and rediscover the power of unity. Personal Growth. Rather than merely reflect the desires of others, identify what you want and be yourself. You can appreciate others without sacrificing your individuality. Honesty is power; be brave enough to admit what you really feel. Fortune Telling. Someone has a secret crush on you. Relationships should be mutual; get rid of a leech. When? Between June 21st and July 1st. The Medicinal Angel. 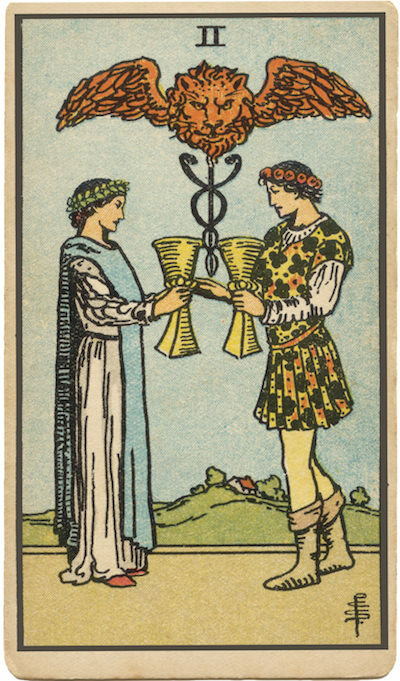 In RWS-inspired decks, an angel and a caduceus (the medical symbol) rise from the two cups, signifying the healing power of love. How might affection be the balm for what ails you now? The Romantic Couple. Many versions of this card depict a couple caught up in intense, hypnotic passion. This symbolizes the power of reflected feeling: the unity achieved when yin and yang combine. In your situation, what’s missing? What’s needed in order to be complete? Balance. Note how often illustrations for this card incorporate themes of balance. Emotional extremes and obsessions unbalance us; tempering your feelings with wisdom may help you feel more empowered. Mutuality. Do your relationships and alliances incorporate a cycle of healthy interdependence and mutual support? Responses to Mutuality. RWS-inspired couples seem to be on the verge of a toast. What do you need to celebrate? To acknowledge? To embrace? The Marseilles Image. Two perfectly-balanced chalices give rise to a beautifully symmetrical blossom. Stability requires equality. Is everyone in your situation equally invested? What role do mutual feelings play? How can I make sure that what I’m feeling is mutual? When was the last time I felt “in love” with someone or something? What do you need in order to feel emotionally stable?